The traditional way of launching a hang glider, either running down a hill or off of the side of a mountain. You don't need a hill to get a hang glider into the air. There are a number of different ways to tow a glider. An ultralight aircraft can tow a hang glider thousands of feet into the air. 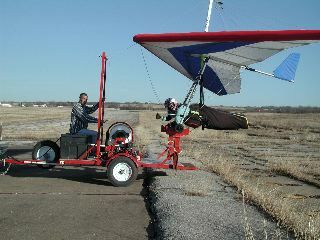 A modified motor scooter can make an excellent winch, and can pull a hang glider to nearly 1000 feet. A truck or trailer equipped with a Payout Winch is a popular launching method in flatland areas. A Payout Winch can tow HGs up to several thousand feet AGL, and any vehicle with a trailer hitch can be the tow-vehicle. It's simple and cheap Junkyard Technology ! A rewind motor can retrieve the towline, before it can hit the ground. Mounts in a pick-up truck, or on a trailer. Another Truck Tow Launch<-check the line available, on that reel! The same payout winch used in truck towing works just as well from a boat. This page was last modified on 28 February 2010, at 11:58.